I haven't blogged in a while. Life is crazy and hectic and I know it's no excuse, but it's only one I have! :-) Spent the first two weeks of October in Germany. Lots of fun and had a good time overall. Our great friends Ruth and Ed took care of all the critters while we were gone. No major problems, but Ruth has resolved that she will get chickens, just no roosters! Ed the last couple of days decided to read our instructions on how to take care of the critters and read the grain amount we give the girls a little wrong, so needless to say they were not happy to see us come back with the "puny amount" we gave them. Thanks so much Ruth and Ed for all your work keeping our critters healthy. Now it's back to reality and needing to keep plugging along. 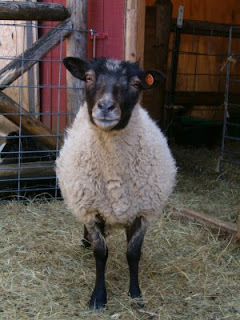 We're going into the winter with more sheep that we had originally planned. You know what they say about the best laid plans. 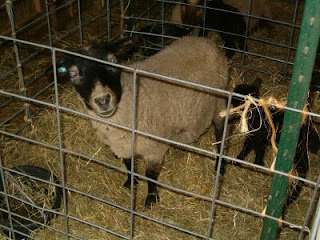 So, knowing that we have a wee bit too many, we're working on only breeding a few of the ewes. Here's the plan so far. SheltrgPines Gulliver (our black gulmoget) will be getting Contented Arwen (moorit), Contented Brisingamen (black), and SabbathFarm Sylph (grey). Underhill Bach (mioget) will be getting Maybelle Sabrina (white), Underhill Mulan (grey), and Islandfleece Viveka (moorit katmoget). 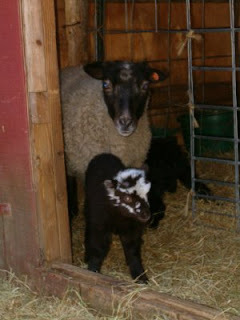 With Bach and Mulan's breeding, I'll be interested to see what the get is like as Mulan is a half poll and I'm not sure what to call Bach (threw a scurred ram lamb this year from Sage and a horned ewe lamb this year from Celebrian). Needless to say, that breeding has the potential for all sorts of things! Will have pictures posted when the groups get put together. 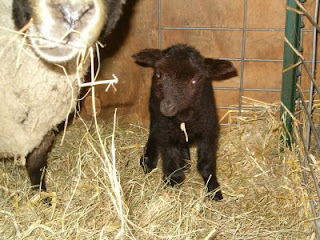 Sylph lambed on April 28th and gave us a little girl. 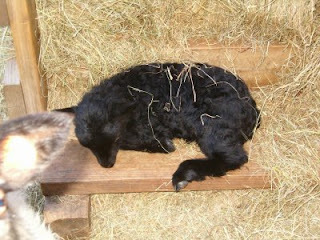 Sabbath Farm Sylph was bred to SheltrgPines Uber. This little girl is going to be grey. She already had sugar lips when she was born. 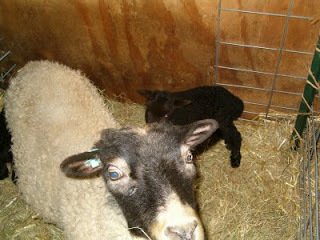 The next day, Wednesday, April 29th, Maybelle Sabrina gave us a little girl as well. 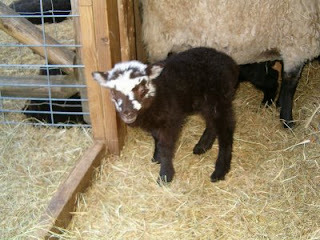 Sabrina was bred to Contented Balder and gave us a little moorit girl! I know now some of Sabrina's genetics! Wahoo! 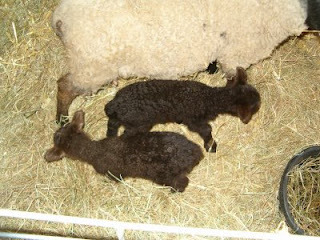 That same day that Sabrina gave birth, Sabbath Farm Celebrian graced us with her twins! Both girls. 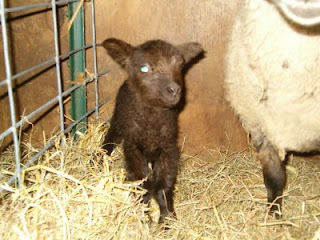 Celebrian was bred to Underhill Bach and gave us a really crimpy moorit/possibly fawn girl. The other I believe will stay moorit. Of course, time will tell and we'll see what we get. 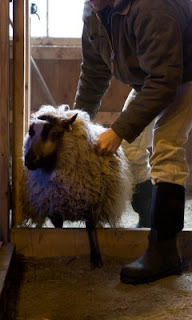 On Sunday, February 1st, our shearer, David Hinman, came to the farm to shear our 25 sheep. We shear in order of color, white first and then continuing on the other colors until we're down to black. Here are a few pictures of the shearing day. All pictures are courtesy of Bryn's DH, Nick. Thanks so much! I tried getting the video camera to work, but it really takes better videos if you hit record! Can you tell I don't use it much?? We'll Nick saved my bacon and allowed me to have some pictures to share with you all. 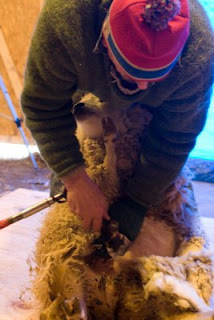 Sabrina being sheared. She was the second to be done. One of my kat twins with a good shot of David. He was concerned that the video camera was going to point at his rear end, so now he can breathe a sigh of relief. Viveka coming through the door. 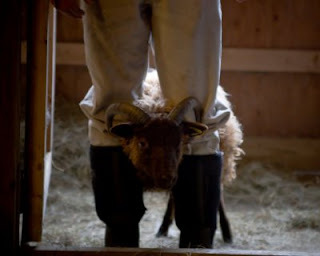 Good to see the wool off of them as she and her twin, Rakel were rubbing against the doorway in their pen every time they would go through. Add a bit of snow and they made a horrible scratchy sound. 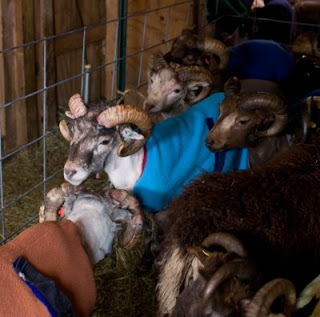 Here's a shot of Minard (red - in front) with Pat getting the fleece ready to be bundled and Oren in the blue coat. I have them bundle my fleeces in bed sheets and I then skirt and figure out what happens with them later. Minard pitched in and helped by taking the fleeces over to Pat and Oren to bundle. 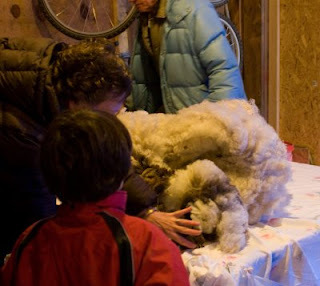 This was his first time seeing sheep being sheared and when we were done, he took some of the belly wool to take into his kindergarten class for show and tell. 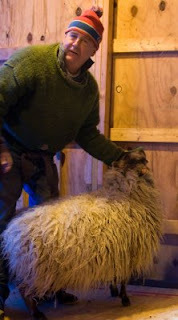 This is Balder waiting his turn to be sheared. Here's another shot where you can see Oren in the background while Mulan, I believe, is being sheared. After they get sheared, each one gets a coat on them. This shot shows Arcturus (blue snuggly) and Wilkins (rust snuggly). You can see that they weren't all done as Gulliver's toosh is still looking very wooly! Some tend to shrug off their snugglies after a little bit, but some stayed on for a while. 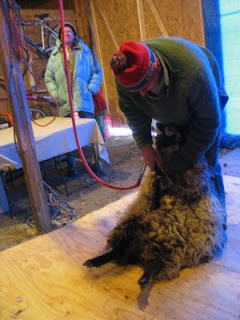 This picture shows David shearing a lamb with Ruth (in the pink shirt) and I'm next to her in the elf/hershey kiss hat. 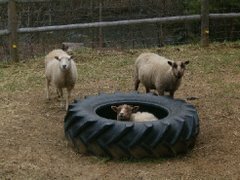 Ruth and my job is to get the sheared sheep and put the snugglies on them and then take them out back to be put back in their pens. We keep them indoors for a good solid week, then remove any snugglies that have stayed on and then normally another week to "harden them off". Then they're released to the elements. 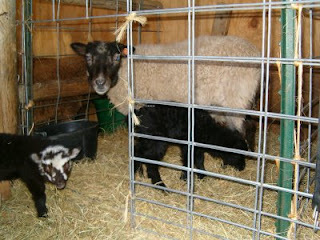 This time, Tim was chomping at the bit and they went outside a few days earlier than I was figuring. The girls had fun running and cavorting like lambs. You can see some baby bellies now. April here we come!